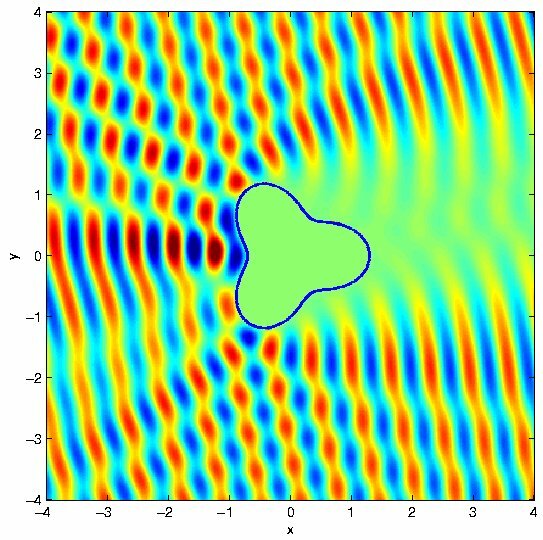 2D wave scattering from an obstacle My goal is for you to learn the theory and practice of boundary-based numerical methods for partial differential equations. I expect to focus on Helmholtz's equation, which describes linear waves (acoustics, electromagnetics, optics, etc) in the frequency domain, and is incredibly useful in engineering/physics. Boundary methods are easier to code than Finite Elements, and are very efficient especially at short wavelengths. The course will split roughly into wave scattering (first part) and eigenmodes of the Laplacian (second part). You will use tools you build to explore some wave asymptotics such as WKB, ray methods, and quantum chaos, or spectral geometry. Week 1: Overview (classification and applications of linear PDE), interior Dirichlet problem, fundamental solution for Laplacian, Green's Representation Formula. Week 2: Uniqueness. Potential theory: single and double layer. Boundary integral equations (BIE). HW1 due: starting Matlab, inverting smoothing matrix operators, plotting and testing double layer potentials. Week 3: User's guide to compact operators, introduction to numerical quadrature, discretization of integral equations: Nystrom method. HW2 due: convergence of interior Dirichlet problem, exterior Helmholtz scattering, far field pattern..
Week 5: Combined-field integral equations. Neumann-Dirichlet map, trigonometric interpolation, spectral quadrature of log singularity. Week 6: Method of Particular Solutions (MPS) for eigenvalue problems, Singular value decomposition. General feedback from HW2. Week 7: Singular basis sets, curing the MPS normalization problem, generalized eigenvalue problems. Rigorous a-posteriori error bounds on MPS eigenvalues. HW3 due: spectral interpolation and quadrature, combined-field integral equation, MPS with plane waves. Week 8: Converting inner products to boundary integrals, Rellich formula. Keller's (EBK quantization) asymptotics for modes on integrable families of rays. Week 9: Physical optics (Kirchhoff) approximation, regular vs chaotic ray dynamics in billiards. Weyl's Law and the trace of the heat kernel. Homeworks fortnightly (3-4 total): chiefly computer coding & investigations (in a language of your choice, eg Matlab, C, C++, Maple), some analysis. HW posted on your webpages rather than handed in. Project: during the final few weeks you will choose then work on a topic (numerical or analytical), give a class presentation and write up. I. Stakgold, Boundary value problems of mathematical physics, Vols. 1 & 2 (New York, Macmillan, 1967-68; SIAM republished corrected editions under Classics in Appl. Math #29, 2000). Berry/Cook seems to have 3 copies of the 1967 editions. Great general introduction to PDEs, Greens functions, spectral theory, Schwartz distribution theory, potential theory, scattering theory, applications. He also wrote the relevant Green's Functions and Boundary Value Problems, 2nd Edition (Wiley, 1998). R. Kress, Linear Integtral Equations, 2nd Edition (Applied Mathematical Sciences vol. 82, Springer-Verlag, 1999). Rather formal functional-analytic background, potential theory, integral operators, numerical methods, more detail than we'll need. Excellent. On reserve at Berry/Cook Library. D. Colton and R. Kress, Inverse Acoustic and Electromagnetic Scattering Theory, 2nd Edition, (Springer, 1998), is a good summary of (`forward') scattering theory. D. Colton and R. Kress, Integral Equation Methods in Scattering Theory (Wiley, 1983). Classic on boundary integral equations, formal style which proves everything from the ground up. Berry/Cook has 1 copy. L. Debnath and P. Mikusinksi, Introduction to Hilbert Spaces with Applications, 3rd Edition (Elsevier, 2005). Functional analysis and operator background we'll need at about the right level. I just found this at Dartmouth Bookstore (it's new to me but seems good; PDE chapter is not very full). Paul Garabedian, Partial Differential Equations (1964), is `functional analysis-free', simple and clear, has integral equations, compactness, minimax eigenvalues, Weyl's Law proof. Scattering theory overview by Tilo Arens. Rainer Kress' forward and inverse scattering analysis lecture notes: go to Teil 1-3 under Inverse Scattering. Volume of d-dim ball, for Lecture 18. Maciej Zworski's lecture notes on semiclassical analysis. Steve Zelditch's expository review, Quantum ergodicity and mixing (to appear, Elsevier Encyclopedia of Mathematical Physics). Jens Marklof's review, Arithmetic Quantum Chaos, destined for the same book. L. N. Trefethen, Spectral Methods in Matlab (SIAM, 2000). Beautiful key ideas of differentiation, interpolation, quadrature on grids, with exponential convergence. Elegant 1-page Matlab codes. R. Kress, Numerical Analysis, Graduate Texts in Mathematics, no. 181 (Springer, 1998). Thorough introduction, with Kress' usual clear but dense style of building up everything with proofs. Good for interpolation and quadrature. W. H. Press, S. A. Teukolsky, W. H. Vetterling, and B. P. Flannery, Numerical Recipes in C, 2nd Edition, available here as PDF files online, also worth buying for your shelf. Good all-round general overview of numerical methods, with lots of practical tips, good intuitive explanations, aimed at users. Not very rigorous, up-to-date or complete on PDEs (sometimes this book annoys numerical analysists, but physicists like it). Marcos Capistran Ocampo's thesis on inverse 2D obstactle scattering, with Yu Chen (NYU, 2003). Download the software from Dartmouth; we have 100 or so on-campus licenses. My 1-page introduction from Math23, intro.m. Simple intro from Utah, Hany Farid's intro reference, and Gilbert Strang's intro at MIT. Dave Raggett's simple HTML guide is all you could ever need. Don't forget to Reload the page in your browser to check updates you made worked. Here is the simplest webpage I ever made (`View Page Source' on your browser). It contains text and one link; you could modify it and replace the address in the link by href="figure1.ps" if figure1.ps is a file in the same directory, for instance a figure file printed to file from Matlab.